ORTH, Godlove Stein (1817-1882) was a United States Congressman from Indiana and acting-Lieutenant Governor of Indiana. War-date Autograph Letter Signed “Goodlove S. Orth” 1pp. 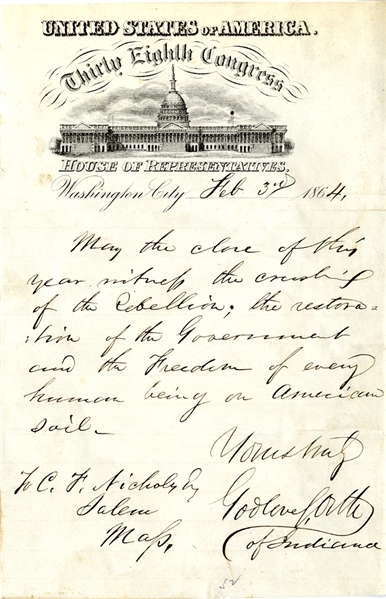 octavo, February 3, 1864, on fine House of Representatives letterhead, addressed to C.F. Nichols of Salem, Massachusetts, and reads “May the close of this year witness the crushing of Rebellion; the restoration of the Government and the Freedom of every human being on American soil.” Mounted, else very good condition.